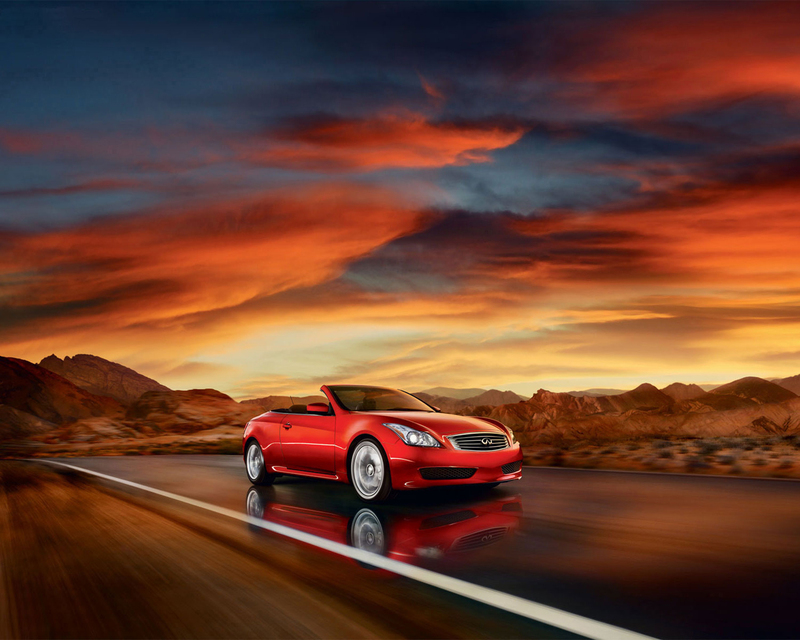 The following instructions walk through the installation of new wheel bearings for all Infiniti G37 coupe, sedans, and convertibles. 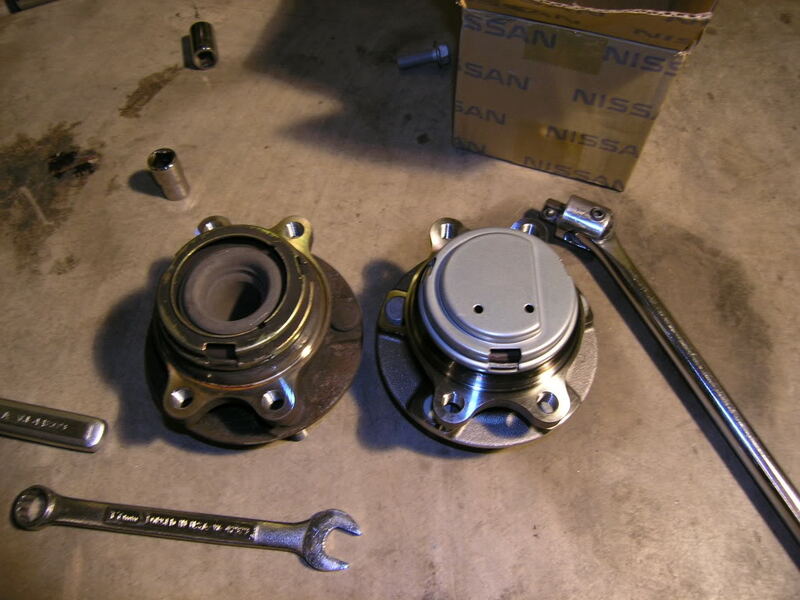 Additionally, these steps can be used on all similarly equipped Infiniti and Nissan RWD vehicles. Step 1. Start by saftely jacking up the car and removing the wheel. 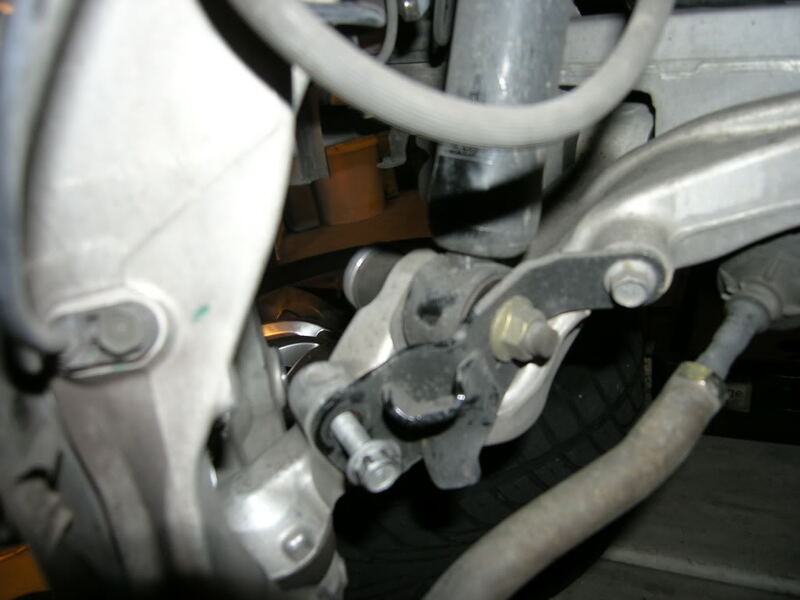 It is best to support the vehicle with jack stands for safety. Step 2. Remove Caliper and Rotor Two 22mm bolts hold the caliper on. 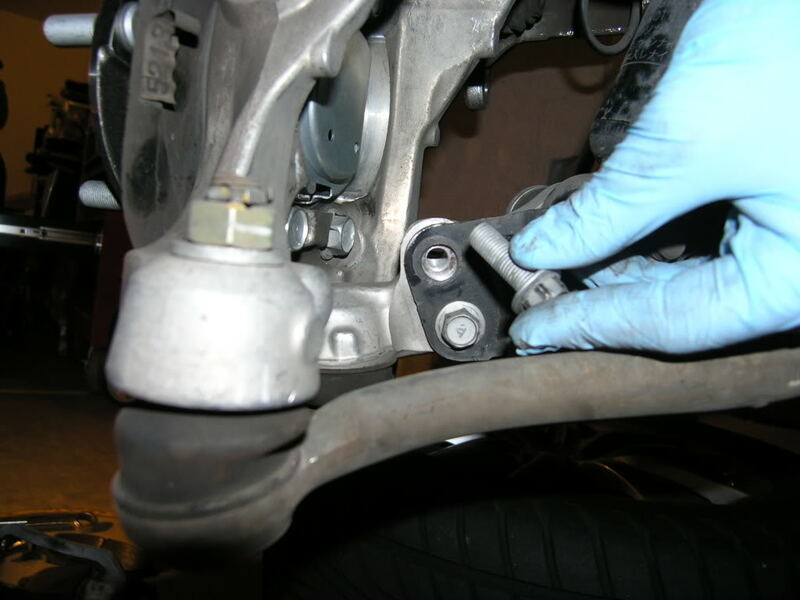 Remove these two bolts and move the caliper to the side. I highly suggest you suspend the caliper and not let it dangle via the brake line. A metal coat hanger bent around the strut can easily be manipulated to get the caliper out of the way or simply use a strap or cord. Remove the rotor and set aside. 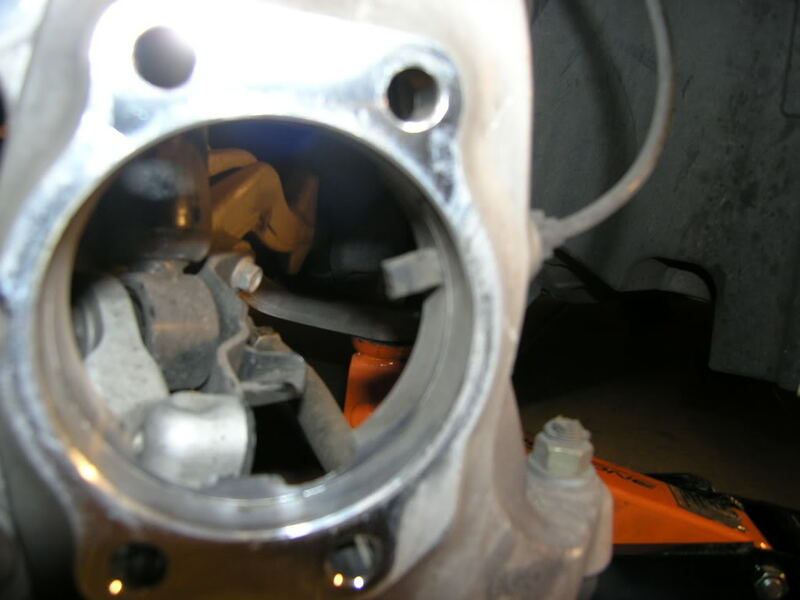 If you need more room to manipulate the rotor then remove the 12mm bolt which holds the brake line clip. Step 3. 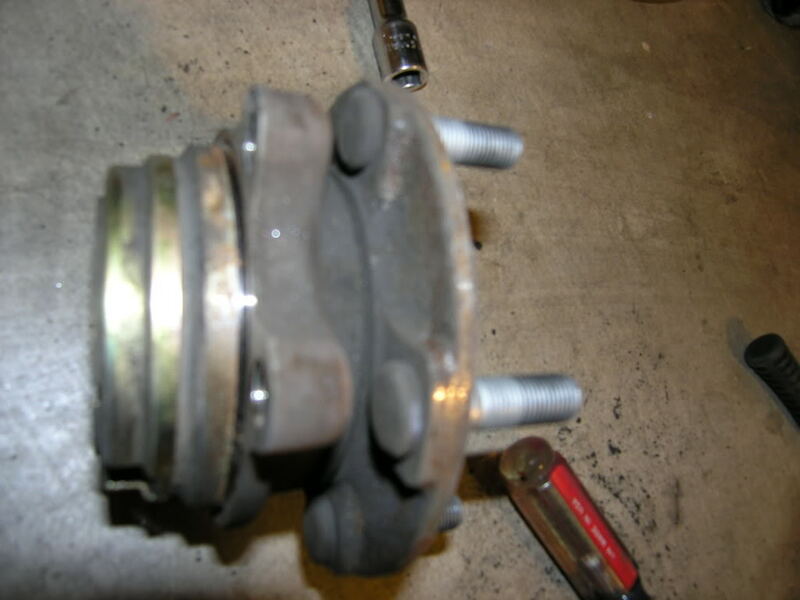 Turn wheels left for drivers side right for passenger side and remove 14mm bolt on lower mount for strut as this will give additional access to the wheel bearing bolts. 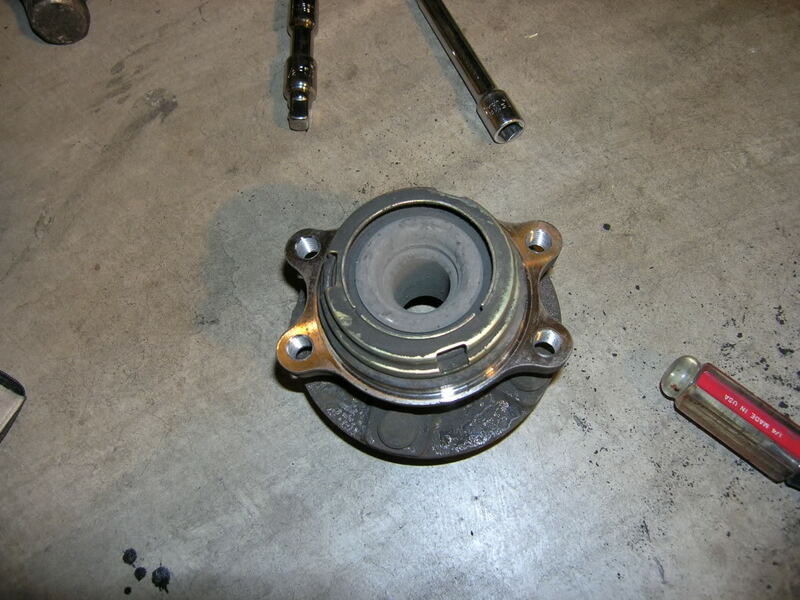 Step 5: Gently work the old hub/bearing assembly out of the spindle. 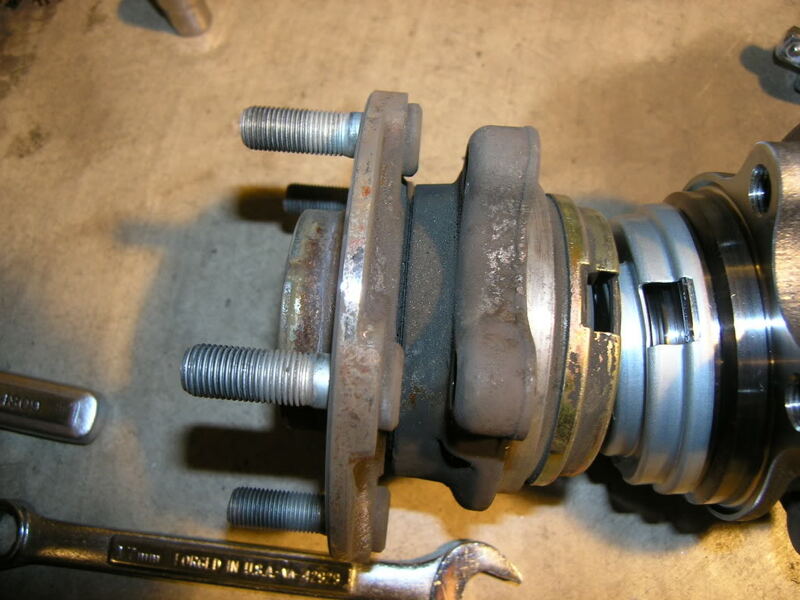 There is a magnetic ABS sensor inside the hub/bearing assembly that feeds through the spindle. Be careful to not break this part! Step 7: Replce the four 17 mm bolts that hold the assembly on the spindle they are cheap grade 9 fine thread these bolts should not be reused. The new ones were bought from the dealership for about $4. Torque to 65 ftlb. 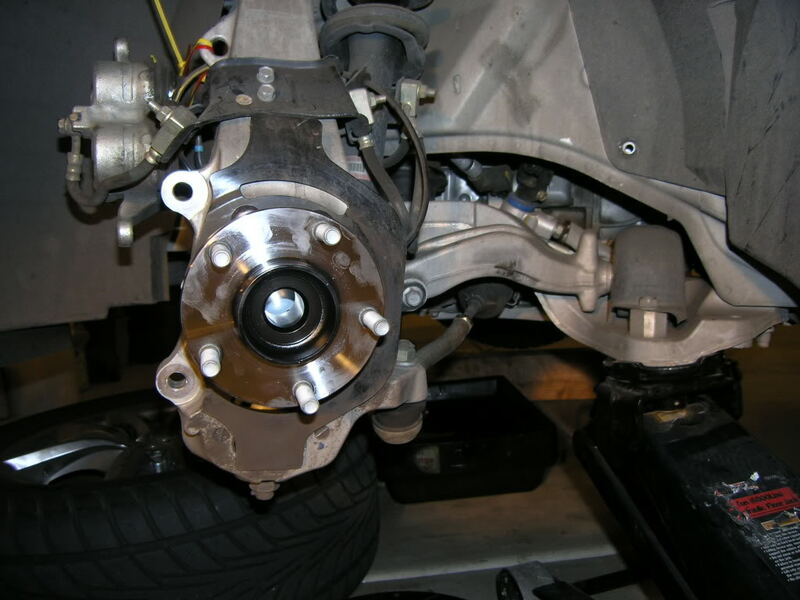 Step 7: Replace brake rotor, mounting plate, caliper (60-91 ftlb front sport brakes*, 98 ftlb front base**) ect. 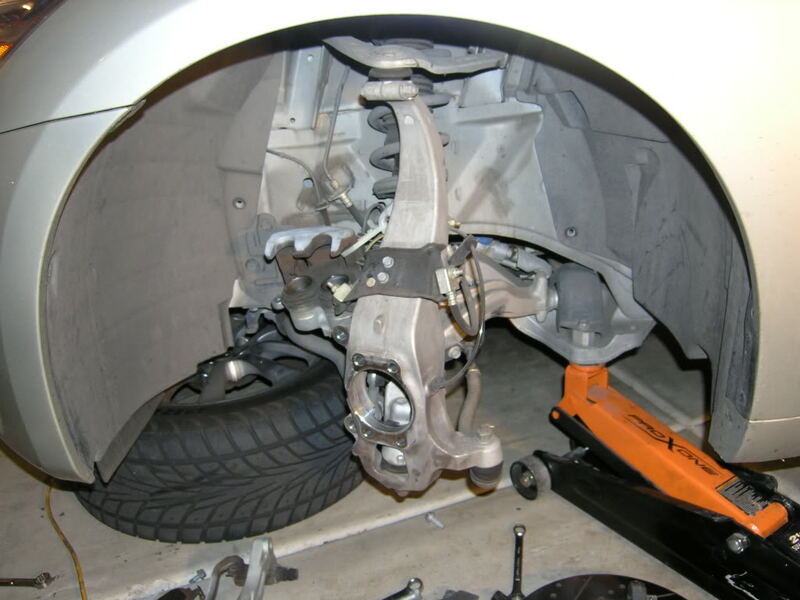 Reinstall the wheel and lower the vehicle back down to the ground. Congratulations, your task is complete if both sides are done...else you are 1/2-way there. * torque specs for sport brakes vary per Field Service Manual. 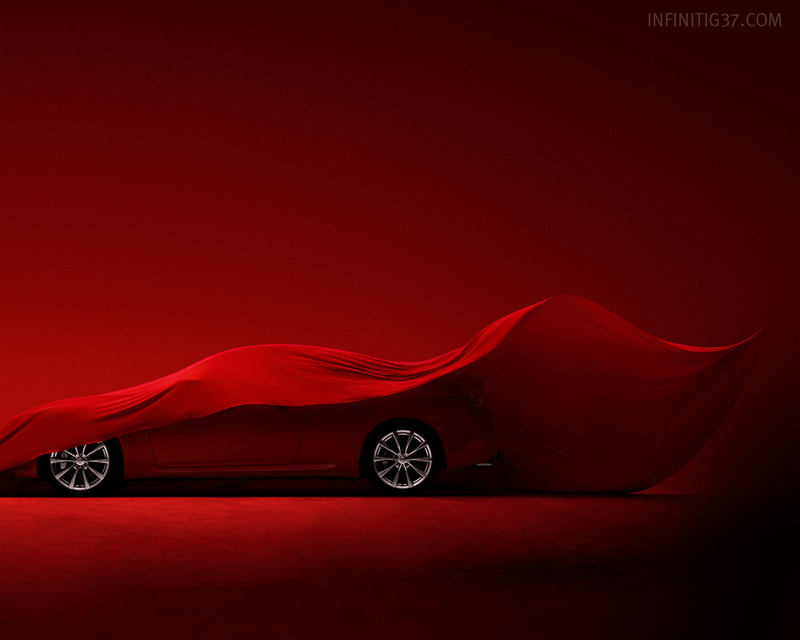 2008 G37 coupe shows 60 ftlb (page BR-41). 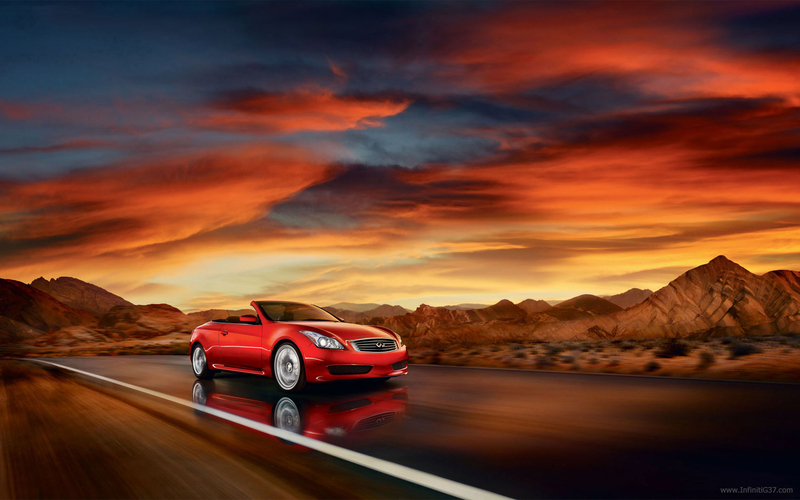 2012 G37 coupe shows 91 ftlb (page BR-47). ** torque specs for base brakes vary per Field Service Manual. 2008 G37 coupe shows 98 ftlb (page BR-39). 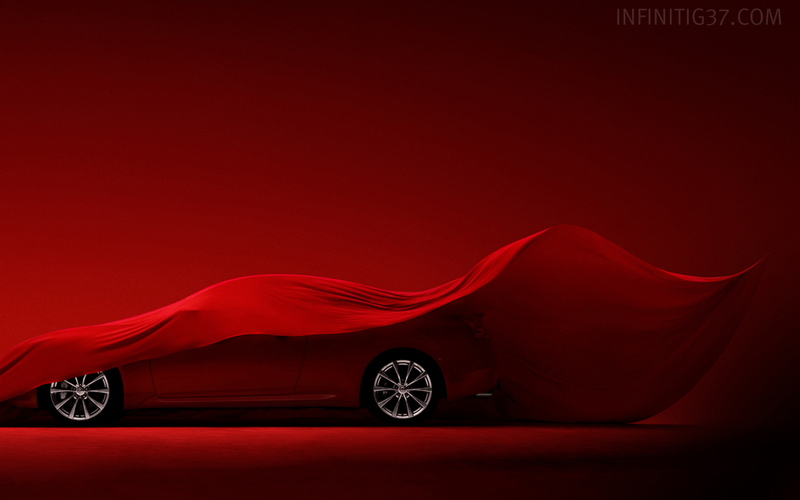 2012 G37 coupe shows 91 ftlb (page BR-44). The difference above seems to be the mounting bolt. 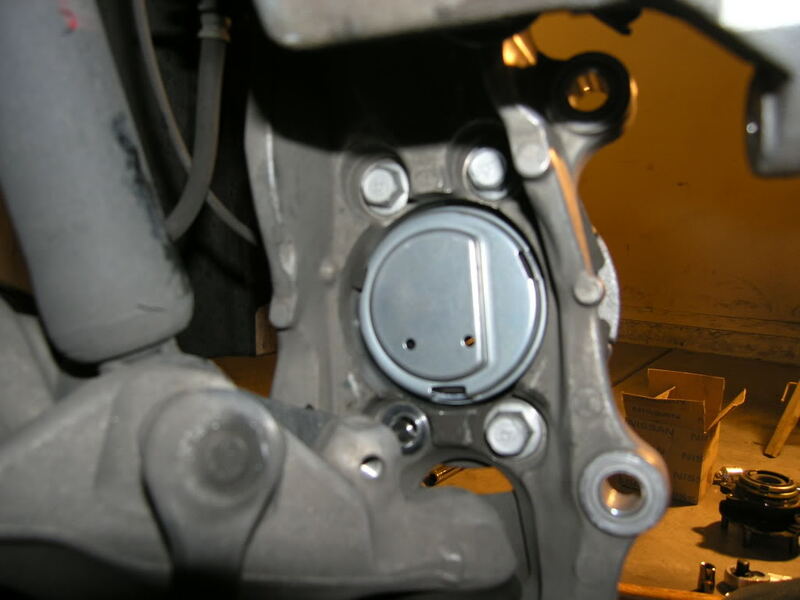 If the bolt is 2-pieces (seperate washer) the torque spec is 98 ftlb but if it's a 1-piece bolt the torque spec is 91 ftlb (2011 G37 Coupe FSM, page BR-42). 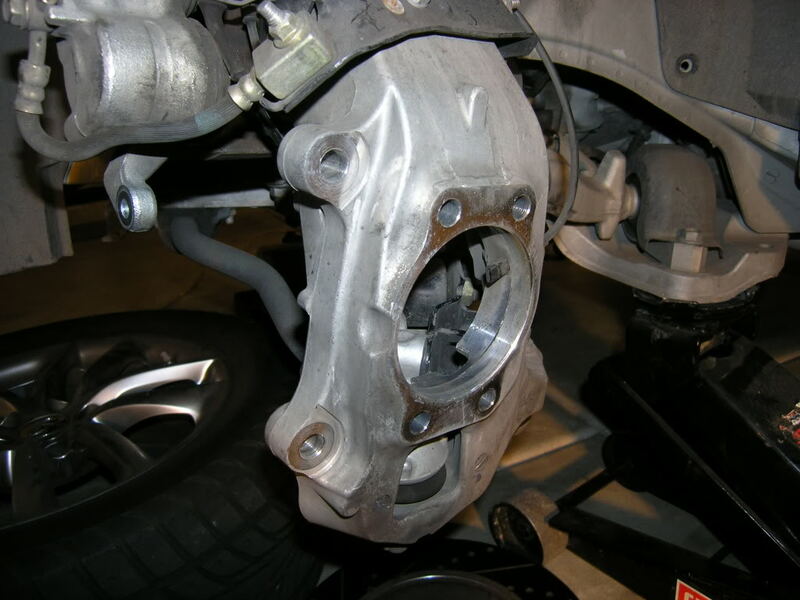 It is my assumption that the 2008 spec rating of 60 ftlb for the sport 4-piston caliper is incorrect and the 91-98 spec should be used for both sport and base. Disclaimer: The author will not be held responsible nor held liable for any damages due to these instructions. Anyone following these directions are doing so at their own risk.